How the European Union deliberately ruined the Cypriot banking system as a warning to other debtors. Let me say right now that I have no secret information as to what prompted the sudden Euro Group ultimatum demanding that taxes on deposits in Cypriot banks be introduced to expropriate part of these deposits in order to recover European loans — without which the banking system could not be rescued. Banking, along with the tourist industry, underpins the Cyprus economy. However, I have a hypothesis that differs from most other explanations offered. First, let us look at what the Russian and foreign press have been saying. They argue that the tax is targeted against Russian offshores and dirty money. Perhaps it is, but only to a small extent. I think most of that money has been removed. What is worse is that the savings which have been frozen will shrink and may disappear altogether. However, the holders of these accounts are not only Russians. There are many Britons and other Europeans, including Germans and Israelis. Other experts — Russian leaders included — say that the proposed scheme for bailing out Cyprus banks by partially expropriating deposits is absurd, unjust, unprofessional and dangerous. Russia’s top financial expert, Alexei Kudrin, claims that the EU and European regulators are mainly to blame for the crisis in Cyprus, because they were reluctant or unable to solve the island’s debt problem in time. I would go along with almost all of these propositions. I do, however, question the claim about the non-professionalism of the Euro Group experts. The Euro Group is the managing committee of the eurozone, in which the Germans call the shots. Demands for a “tax on deposits” are indeed absurd and unprofessional if they are aimed at rescuing the Cyprus banking system and economy. When the Cyprus parliament agreed to the introduction of these measures — basically amounting to political suicide — the country’s banking system was doomed. The reason was the ultimatum. Banks are based on trust. Cypriots have agreed to a confiscation tax, which means that trust in the Cyprus banking system has been lost irretrievably and will be impossible to restore in the foreseeable future, even if Europe and the IMF bail the Cyprus banks out. The Euro Group financiers should have known this. So they destroyed the system deliberately, realizing that it would tarnish the reputation of the entire European Union banking system and that the price would be the massive transfer of money to other (primarily Asian) banks. It is absurd is to risk the stability and reputation of the whole European financial system — to risk losing the trust of tens of billions that would flee, ruin the economy of the European Union and the eurozone, just to spite several thousand Russians, Brits, and Russian companies with state connections. So, let me repeat, the whole affair is not about Russia. If my guess is right and what we are seeing is a deliberate trashing of the bankrupt Cyprus banking system (or the economy as a whole) then what is the big idea? I would hazard a guess that this has been done to set an example — that is relatively painless for the whole of Europe, but catastrophic for Cypriots — of what is in store for the southern European countries if they renounce austerity measures and de facto external financial management. Cyprus is an island of just 800,000 people. It is not Greece, which, if it exploded, would threaten the political stability in the Balkans. It resembles Italy or Spain even less. Futhermore, because Cypriots most likely will not accept the ultimatum and de facto external management (which does not bode well for them either), then it may be that the country — along with others — is being prepared for being thrown out of the eurozone. 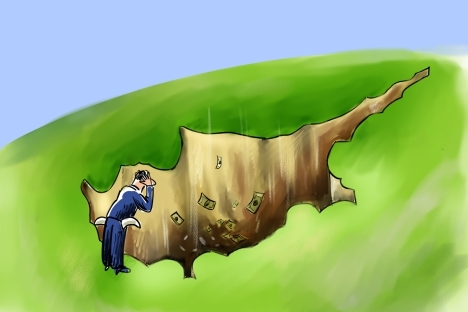 The collapse of Cyprus may thus be intended to either push some countries out of the eurozone or to issue a warning to the southern European countries and force them to accept the rules of the game imposed on them from outside. In putting forward this hypothesis, it is not my intention to accuse Germany and its allies of callous imperialism. It may be the beginning of a truly difficult struggle for the preservation of Europe. And Europe does need saving. If I were in Germany’s place, that is how I would act. Now a word about Russia’s policy. There is no need to feel insulted. If Russia and other European countries had been consulted, there would have been no surprise effect or any hope for keeping the crisis under control. Should we bail out Cyprus or its banks? By hindering the Germans, we will lose much and gain nothing. Unilateral lending or buying out banks’ assets would be nothing but a senseless waste of money. It would be of no avail to the Cypriots either. Sergei Karaganov is the Honorary Chairman of the Presidium of the Council on Foreign and Defense Policy.